The Cuisinart C59CE-8SLB is a 8-inch bread knife. This knife comes to produce clean cuts of meat. The ergonomic handle is designed to help slice accurately through roasted meats, sandwich bread, fruits, and vegetables. 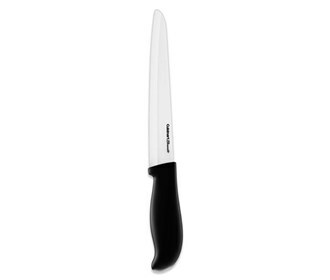 This knife has a blade that is of superior quality than stainless steel and is break-resistant. The Cuisinart C59CE-8SLB has many exciting features for users of all types. The Cuisinart C59CE-8SLB is sold as a Brand New Unopened Item.